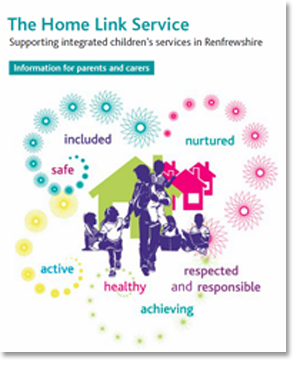 The Home Link Service is one of the services working to support children and families in Renfrewshire. It is made up of four area Home Link teams, based in different areas across the authority and linked with schools in the area. The purpose of the Home Link Service is to develop and improve links between home and school with the aim of improving achievement and attainment for identified pupils. All the work we do tries to involve parents and carers in a partnership to improve outcomes for their child’s learning and wellbeing. Click on the ‘Home Link Service’ document opposite for more. You can find out more either through your head teacher or by contacting your local team direct. Pupils can find out more from their Pastoral/Guidance Teacher or from Mr Bruce and Mrs Brown, Home Link. Renfrew and Erskine Area Home Link cover Renfrew High School & Associated Primaries, Trinity High School & Associated Primaries and Park Mains High School & Associated Primaries.